The Wangan and Jagalingou Family Council, who consider themselves “the proud traditional owners and native title applicants of a vast area of land in central-western Queensland”, taking a cue from a letter written by senior United Nations (UN) official to Australia’s UN representative in Geneva to suspend the Adani coalmining project, has declared that it would go ahead with its Federal Court appeal against Adani’s “sham Indigenous Land Use Agreement”. The Grata Fund, whose patron is former federal court judge and corruption fighter Tony Fitzgerald AC QC, and whose board includes former Victorian judge Marcia Neave and human rights lawyer Jennifer Robinson, has stepped in to guarantee the bond for the five appellants. The W&J Council says the Traditional Owners and their community refuse to back down, and the Council will continue its campaign to defeat Adani and its political and industry barrackers. The Council is also grateful that the United Nations Committee on the Elimination of Racial Discrimination (UN CERD) has stepped in to demand Australia consider suspending the Adani project over apparent Indigenous rights breaches. W&J Traditional Owner and lead spokesperson Adrian Burragubba said: “Adani is attempting to invade, occupy and plunder our land, contravening our human rights and denying us our property, under the cover of a bogus land use agreement. Their rent-a-crowd ILUA is not supported by the legitimate W&J Traditional Owners from the Carmichael Belyando native title claim area. “We have made sure our Federal Court appeal can proceed because we are determined to prove that Adani does not have our consent for its mine, and to ensure it is never allowed to destroy our country and our future. “Our people have survived 231 years since the start of colonisation in this continent, and we can survive this onslaught from Adani. We are determined to defend our country from destruction”, he said. The confirmation of the appeal comes as the UN CERD has intervened under its early warning and urgent action provisions to demand Australia answer concerns about breaches of the W&J People’s internationally protected rights. The UN expressed concern over the ‘Adani amendments’ to the Native Title Act in 2017, as well as alleged breaches of the International Convention on the Elimination of All Forms of Racial Discrimination, and the failure to obtain the genuine “free, prior and informed consent” of the relevant Traditional Owners. Linda Bobongie, Chairperson of the W&J Council said: “We have called on the UN CERD to highlight our plight and to bring pressure onto the Australian and Queensland Governments to prevent these threats from Adani to our people and to our traditional lands and waters. “The legal system is being used as a weapon against us because we have chosen to stand up to defend our lands and waters, and our rights. Discriminatory legislation, such as the Native Title Act, and punishing costs, are allowed to override our rights and leave us open to ruthless suppression by an increasingly desperate and farcical Adani”, she said. Bobongie, is writing on behalf of the Council to Michel Forst, United Nations Special Rapporteur on the Situation of Human Rights Defenders, and Victoria Tauli-Corpuz, United Nations Special Rapporteur on the Rights of Indigenous Peoples, over ongoing abuses in relation to the Carmichael project and Adani’s recent move to bankrupt W&J leader, Adrian Burragubba. 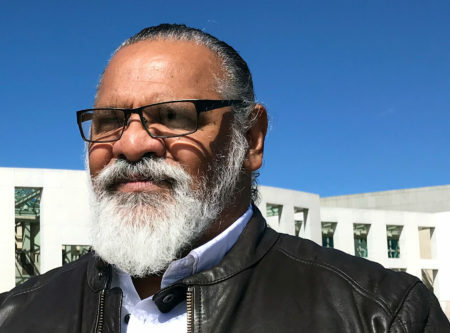 Bobongie said: “We are requesting interventions from the UN Rapporteurs, and we will be calling on social justice groups and our hundreds of thousands of supporters around Australia to back our demands. “We ask the Queensland Government to provide protection from bankruptcy to Burragubba and the other appellants. We demand Adani cease its harassment and undermining of Burragubba and cease its bankruptcy proceeding. And we call on the Commonwealth Government and Opposition to ensure that access to equal justice to defend our rights is not undermined by punitive cost orders and the kind of aggressive corporate conduct Adani is allowed to engage in. “Australia’s legal system does not recognise that human rights defenders, such as Burragubba, are acting in the public interest and we are therefore subject to potentially crippling costs. This is a recognised problem with serious consequences. “UN Rapporteur Tauli-Corpuz has reported that ‘a global crisis is unfolding. The rapid expansion of development projects on indigenous lands without their consent is driving a drastic increase in violence and legal harassment against Indigenous Peoples… The root of this global crisis is systematic racism and the failure of governments to recognize and respect indigenous land rights’”, she said.